Ever go to a public swimming pool? Pool rules are always posted to protect everyone and insure a safe swimming experience. 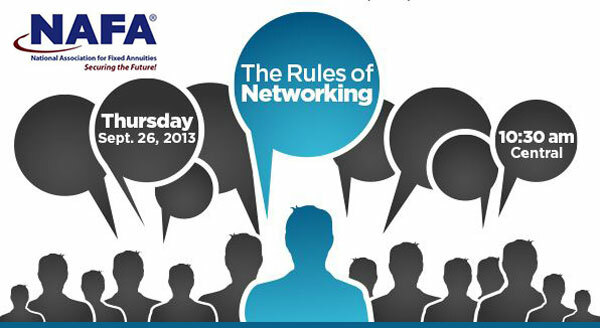 Learn how you’ll be more effective when you know the “Pool Rules” of networking. In this NAFA education webcast, you’ll learn how to properly approach networking, while generating more prospects, referrals, and business! Don’t Miss This Informative 60-Minute Webinar! Guest presenter Michael Goldberg is a speaker, author and networking strategist. In this webcast he’ll share the most important rules of networking. Looking for someone in your corner? NAFA, the National Association for Fixed Annuities makes issues that affect fixed annuities a priority EVERY DAY!